Non-exempt California employees are entitled to one ten-minute rest break for each four hours worked, and employees who are denied these rest breaks are entitled to an hour’s worth of pay at the employee’s regular rate. 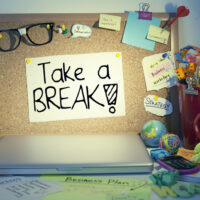 There has long been disagreement among employers and courts in California as to whether or not a rest break is truly a rest break if the employee is required to remain on call during break time. Recently, the California Supreme Court issued a long-awaited ruling on the topic, determining that a rest break during which an employee must remain on call in some way does not comply with relevant California Labor Code sections and Wage Orders. The case in which the Supreme Court recently ruled is Augustus v. ABM Security Services, Inc. The plaintiffs in the case were private security guards. During their ten-minute rest breaks, ABM required the guards to carry their radios and pagers with them so that they could respond to any calls from the clients they were tasked with protecting. The guards filed suit against ABM on a class basis, claiming that they were entitled to damages for failing to receive rest breaks, since, in reality, the guards had to continue working by remaining able to respond to a call through their breaks. The trial court agreed with the plaintiffs, awarding them some $90 million in damages. The Court of Appeal reversed this decision, ruling that, since the Labor Code did not say explicitly that employees needed to be relieved of all duties during rest periods, as it does regarding meal periods, that the allegedly unlawful employment practice didn’t fall afoul of the law. This decision will have major implications for California employers, notably those whose workers must respond to emergencies. Those in charge of handbook creation and rest break policy should contact a California labor and employment attorney as soon as possible for assistance with ensuring that their rules on rest breaks are in compliance with the current state of the law. If you are in need of knowledgeable and professional legal assistance with an issue relating to California labor and employment law, contact the seasoned Bay Area employment lawyers Richard Koss and Rand Stephens for a consultation in Redwood at 650-722-7046, or in Antioch at 925-757-1700.